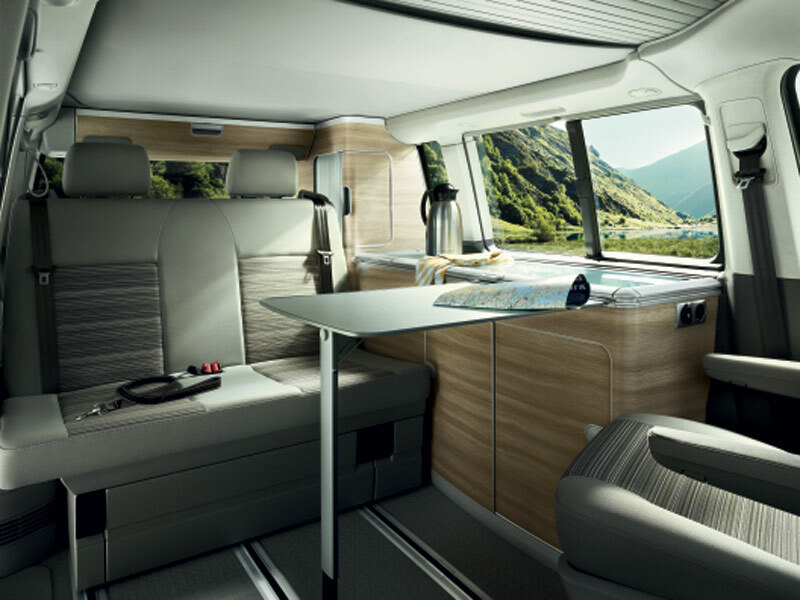 For more than 60 years, Volkswagen has allowed some very clever and talented engineers to transform its basic bus or van into its iconic Camper. For many, the VW van and its better outfitted Camper sibling evoke a wave of nostalgia from hippies and peace signs to wholesome family trips in those halcyon days when people actually had time to vacation as a family and Route 66 beckoned millions to the promised land: California. An old Hippie-styled VW Camper. 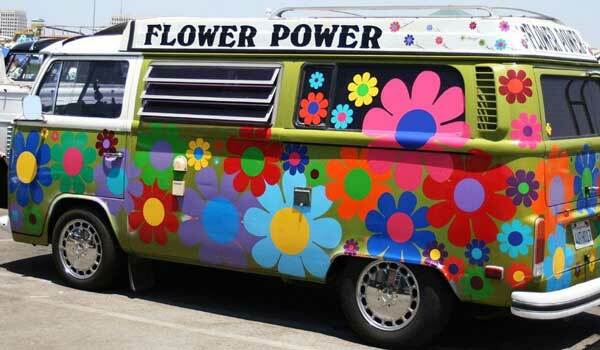 Gotta love the flower power! In das vaterland, the name “California” must evoke the very spirit of the outdoors, adventure and freedom. Think camping in the Yosemite Valley or surfing on Malibu Beach. The Germans must really love it here because, for the past few years, the VW Camper has carried the proud name California. 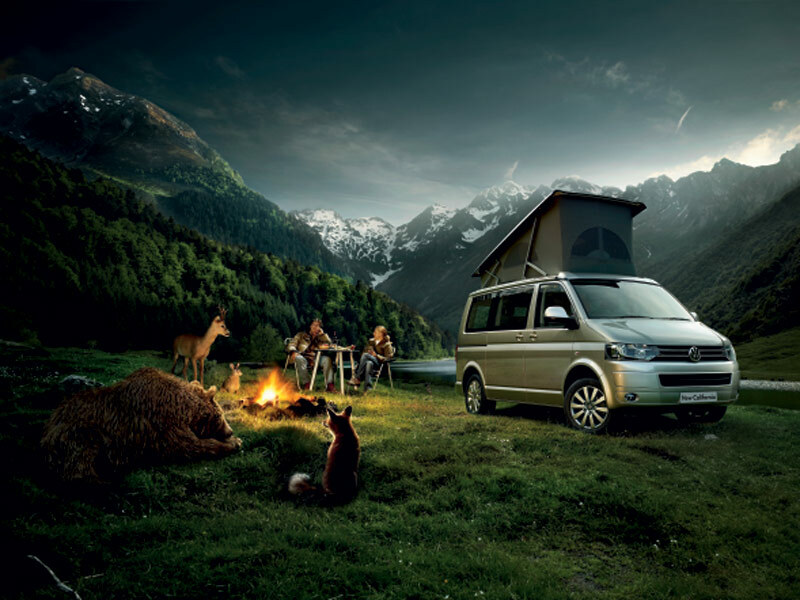 And in typical VW form, the California Camper is not available in California or any other of these United States. California surfers, Malibu Beach - all pretty pictures! 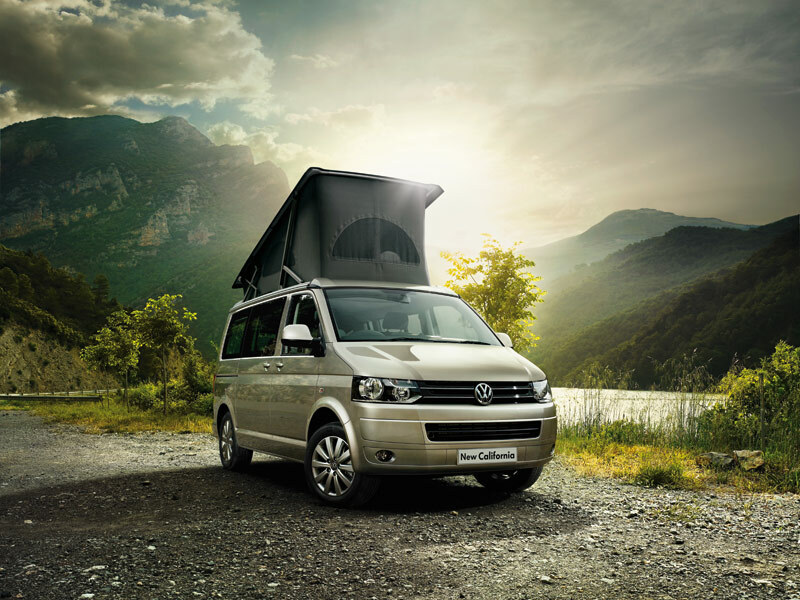 Volkswagen hasn’t sold the Camper in the US since the 2003 model year. The Touareg SUV replaced the Camper in 2004. Ugh. Since then, a cottage industry has sprung up around buying, selling, restoring and loving these rare manatees. 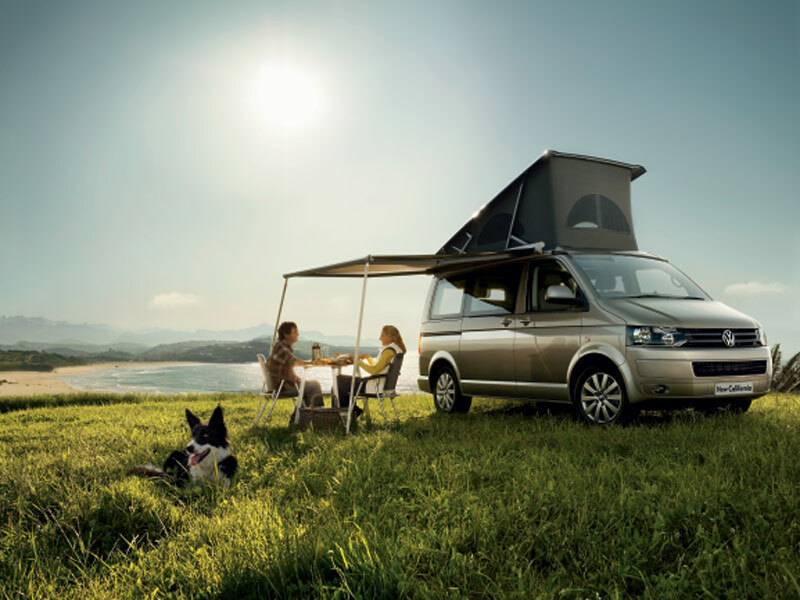 VW’s CEO, Martin Winterkorn, says VW is looking to fill niches in the US market; but so far, the braintrust in Wolfsburg and it’s American minions don’t think Americans will buy enough California campers to justify the cost of certifying and importing them to the US. There is also the obstacle of the high price. For example, in the UK, a new California starts at £40,000. At current exchange rates, that’s around $60,000; but my experience is that when comparing UK and US car prices, pounds often equal dollars. But here’s some evidence of US supply and demand. Recently, a nice 2002 Eurovan full Camper with only 56,000 miles was listed on Poptopheaven.com (located in Yucipa, CA) for $39,700. 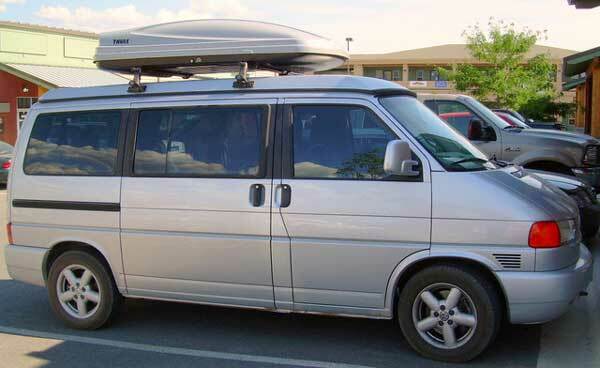 The fully-loaded price of a new 2002 Eurovan camper was $42,000. And that price wasn’t an anomaly. I’ve always had a secret desire for a German bed on wheels so I’ve followed these prices for years. They are hard to find, particularly in good condition, and even examples 20 years old sell for as much or more than their original sticker price. So there is definitely a niche market for this German Swiss Army Knife of campers. Unfortunately, instead of selling a US version of either the Caravelle (the current name for the VW van) or the California in the US market, VW went with the cheap, rebadge option of partnering with Chrysler to turn a Town & Country minivan into the moribund Routan. Through November 2010, despite heavy subsidies and expensive marketing campaigns, VW sold only 14, 714 units. I guarantee that if VW sold its own product in the US, sales of the Caravelle van alone would easily exceed that number. Here is is, folks. 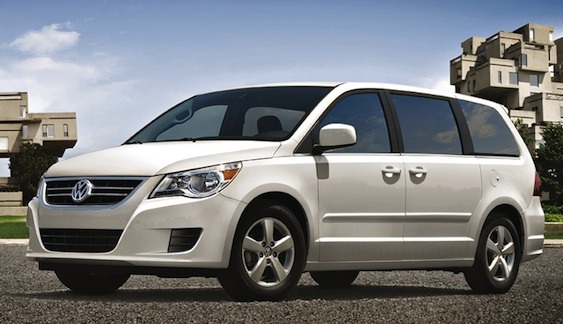 The VW Routan, a Chrysler Town & Country minivan without Stow-n-Go seats (the only thing good about the Chrysler). Can you say hideous? I mean does anyone want a VW badge on a Chrysler-built vehicle? We know how well the shot-gun marriage of Daimler Benz and Chrysler went. There was a very unhappy divorce. Is there any reason to believe VW would fare any better? No. I thought I’d torture myself by checking out the California on VW’s UK website. Here are some marketing highlights and pictures. Take one Volkswagen California. Equip it with a two-burner hob, kitchen sink and 42-liter cool box. Mix in two chairs and a table that folds away neatly into the tailgate. 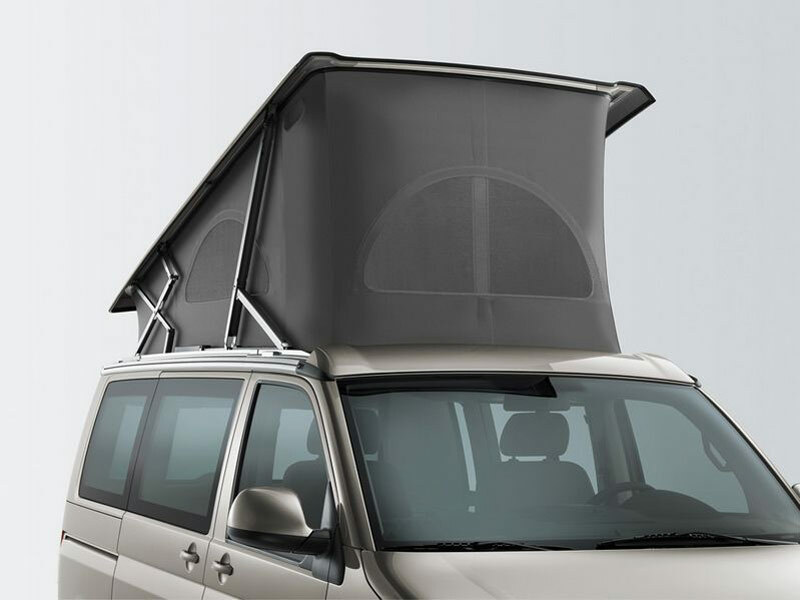 Then top it off with an optional awning for some alfresco dining. There you have it. The recipe for a perfect holiday in the great outdoors. Ah, California's awesome natural scenery. Pretty ideal camping spot, huh? Can't you hear the Beach Boys singing "Good Vibrations?" 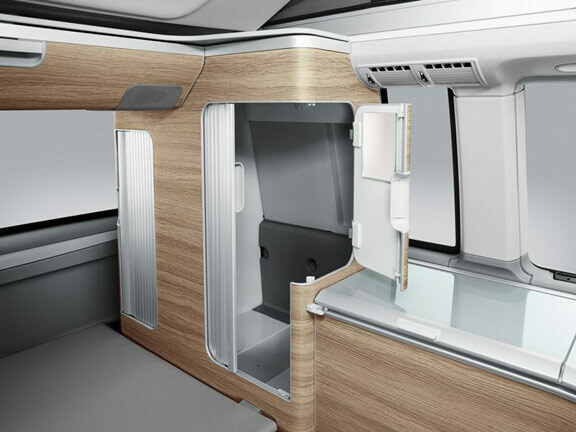 The new California’s high tech, innovative interior gives you maximum flexibility, ensuring escaping is easy, whether you want to follow the surf or the sun, or take to the open road and sleep where you like. 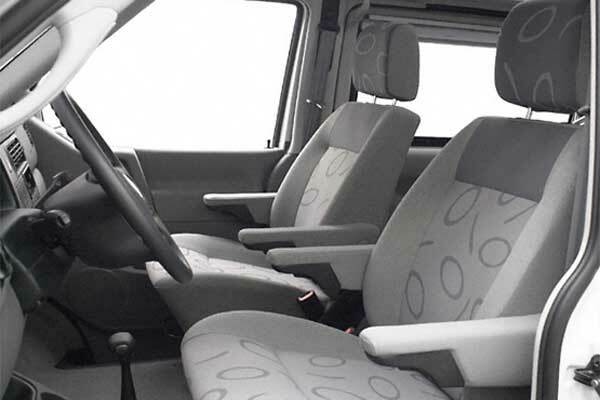 Seating: Luxury front seating gives you all the support you need, to the side and below. Each fixed-height seat has two armrests and swivels through almost 180 degrees. Combined Cooker and sink. Fire up the two-burner hob with Pizeo-ignition and you’re ready to cook. Wash up with the removable bowl in the high-grade steel sink and fold everything away under the glass top. Slick interior with refrigerator, 2 burner gas stove, table and sofa. Flexible worktop: When you need some extra space, just make use of the moveable worktop which is suspended from the kitchen unit and rests on a single-fold-down leg. Lots of great storage space. 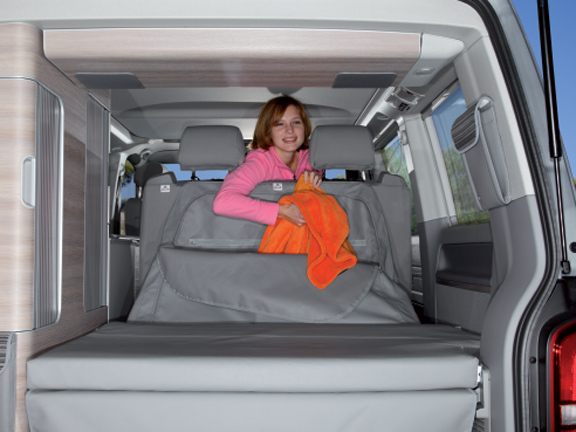 Sleeping and Pop-up Roof: Four people can sleep very soundly in the Volkswagen California. 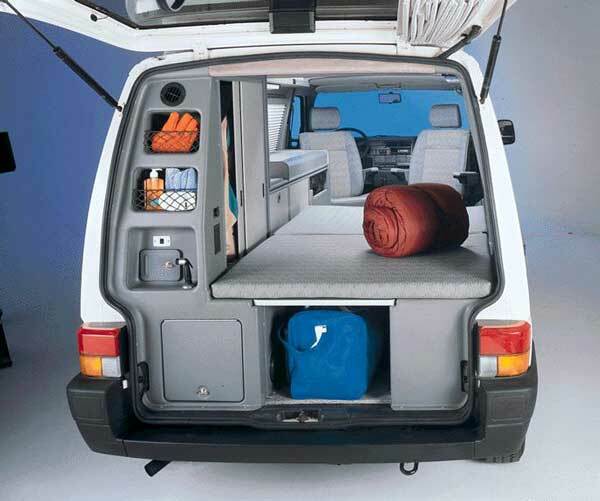 The rail system moves the back seats smoothly and converts into a bed measuring 114 x 200cm (45 x 78 in). 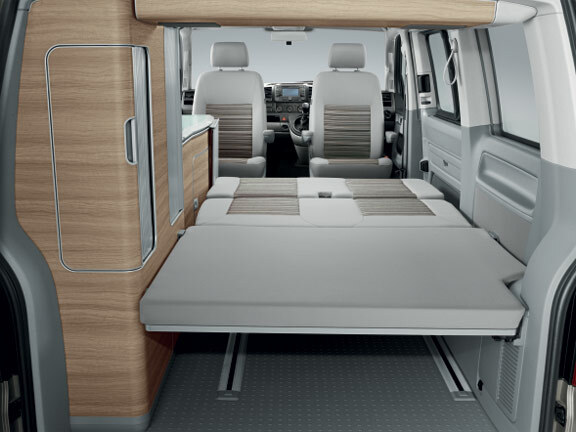 And at the press of a button, the electro-hydraulic roof pops up to reveal a double fold-out bed. The high quality mattress opens on its slatted frame to a generous 120 x 200 cm (48 x 78 in). So when the night-time comes, simply relax in the knowledge that you’ll be ready for the adventures tomorrow brings. The pop-up top is power assisted these days. The interior seat/sofa folds into a double bed. Rear gas bottle cupboard: You can tuck away a 2.8 kg bottle (about the size of a propane tank for your BBQ) of camping gas in the California’s rear cupboard. It’s just another way of saving valuable space. Upholstery: Inside the California there’s a choice of comfortable yet hard-wearing seat upholstery that’s ready to face your next adventure. Safety: As well as an Electronic Stability Program (ESP) that adjusts power to the wheels to help avoid under and over steering, the California also comes with ABS, EDS, ASR, MSR, and hill hold assist as standard. 4Motion all-wheel drive is available. Airbags for driver and passenger with passenger airbag deactivation. Front and side air curtains. Engine Specifications and Fuel Consumption: The California boasts a selection of TDI common rail engines that let you pick the ideal power band for your needs. There are four to choose from; each engine is quieter and more fuel-efficient than ever before, and all comply with Euro V emission standards. And every time you make a gear change you’ll save even more pennies, thanks to our 7-speed Direct Shift Gearbox (DSG), with gearshift indicator technology as standard. The largest engine is a 2.0 liter TDI. It’s good for an average 29 mpg. Not bad considering the front drive Camper is a heavy boy – 3,000 kg or 6,614 lbs. Zero to 60 is a glacial 12.4 seconds with a top speed of 117 mph. But hey, when you’re on holiday in a VW Camper, savoring the Great Outdoors at a slower pace is part of the charm. So there it is my friends, another great product, modeled on the California lifestyle, desired by many and available to no one in the U.S. market. Great article on the VW Camper. No idea about the California! A friend of mine rents out his VW Westfalia, he lives in the Half Moon Bay area in California: http://www.outdooradvco.com/oac/VW_Campervan_2.html Old VW vans are hard to find in No. Cal., he actually found it on Craigslist and drove to L.A. to buy it. I love these little campers! They’re just so practical. Elle, I’ve talked to lots of people who don’t know that the VW California exists. They are perfect for road trips, camping, climbing, cycling, etc. Wish they were sold in California! Is there no way around this? Like buying from a European dealer and importing it ? I have no idea how this process works, but I WANT A NEW ONE! I have looked online for used ones and have a hard time paying the kind of money people want for used ones, when for a bit more I could just buy a new one and keep it for years. 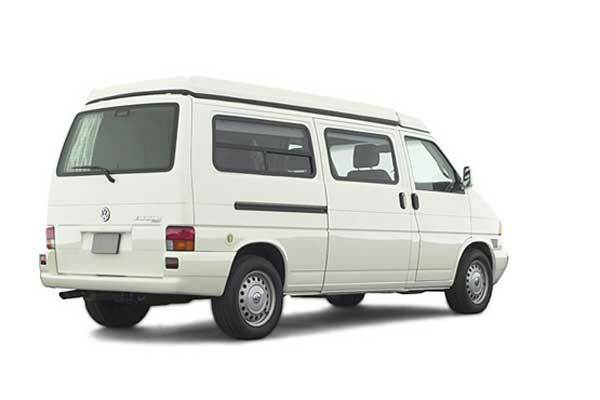 As far as I know, there is no way (that is affordable) that you can bring a VW California into the U.S. A car has to be 25 years old to qualify as a “classic” which can be imported without going through the long and expensive process of federalizing the car – safety, emissions, etc. The van on which it’s based was never imported so it would be very expensive to (prohibitively so) to modify it to meet US standards. Most European manufacturers offer European delivery of their vehicles — but only the U.S. version of that vehicle. You drive it around Europe and then it gets on a boat back to the U.S. I wish there was a way around it, but that’s why you don’t see new Euro-only models driving around the U.S. The only way around the law (that I can think of) is being a member of a diplomatic mission from Germany and bringing your consular car with you. Even that, I’m not sure the foreign service people of other countries are allowed to do it. Most just buy or lease a car here that is from their home of country. It’s much easier to get it serviced. can do with a few pics to drive the message home a bit, but instead of that, this is magnificent blog. 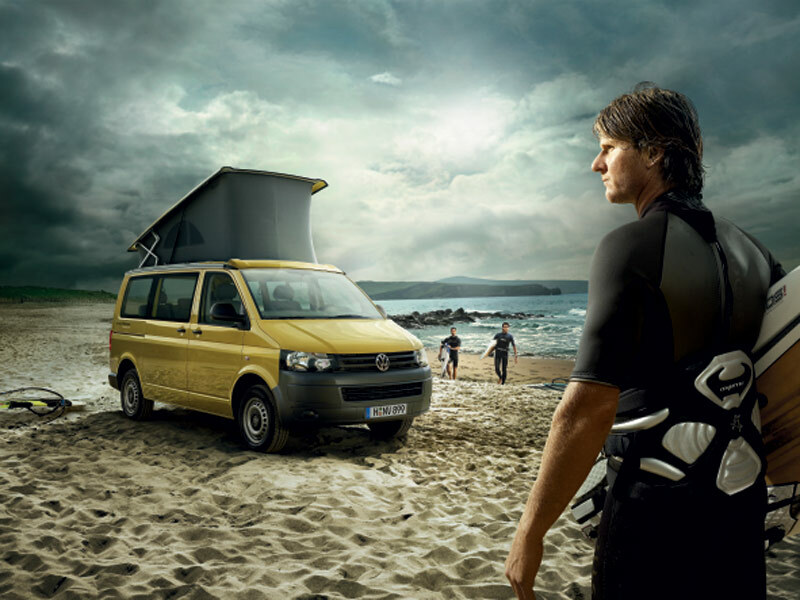 Are the VW California’s available in Mexico or Canada? What an awesome camper van that looks like it can do it all. I want one in CA!!! I don’t believe the VW California camper was available in either Canada or Mexico. Even if it was, I think it would be difficult to register it in the U.S. as it was never homologated for sale in the U.S./North America. You can’t bring one into the U.S. as the cost of federalizing it would be prohibitively high. A car has to be 25 years old or older to import it without having to go through all the federal road blocks. There are a lot of people who would want this vehicle. If it was available in Canada or Mexico, we would have seen one for sale on PopTopHaven.com or TheSamba.com. There hasn’t been one. As far as I know, the only way to get one here legally is to be a member of a foreign council corps that allows you to bring your personal car here. The diplomatic/treaty relationship between a foreign country and the US trumps most federal and state laws. They were available in Canada. I own a 1992 California that somehow got imported into the States from Canada. It was refurbished by Pop Top Heaven in 2012-13. It’s more refined than the Winnebago conversion and a big improvement over the Vanagon Westy that I used to own. When I put it in the 2013 Chirco Bugtoberfest car show, it was mistaken for a new car display. Kris, VW never used the California nameplate in the US market (to my knowledge). 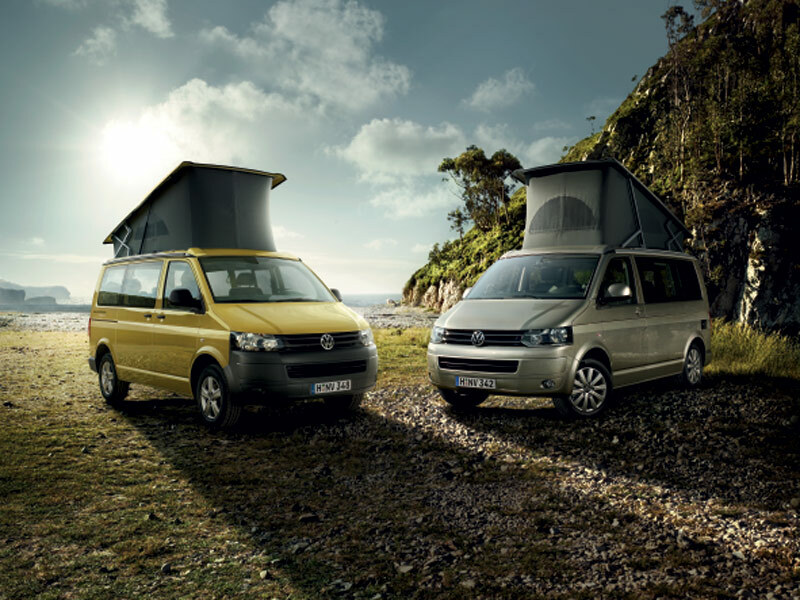 However, we did have VW campers up until 2003. I’d be interested in seeing pictures of your 1992 model. I drive by Pop Top Heaven in Yucaipa frequently. They do a great job of refurbishing and reselling them. VW continues to sell a slick modern California in Europe and the UK. Great blog. I stumbled on it after googling something like “why Californias can’t come to California” (my best friend owns a Westie and she’s a nut about these things). Any hope for the bestie to replace her Westie? BTW your name was familiar from where I worked back in the late 80s/early 90s. Yep, that was you! @Lisa Thanks for checking out my blog. I sure wish VW would reconsider importing its vans again. I’d love to see a replacement to the old campers or Westies. PW in the 80s?? Oh that was a lifetime ago. LOL. The Saabs were quite trendy back in the day, so you can be excused. There were others there who owned them if I recall. there is Dodge Illusion which probably is the closest to the California….not as functional as the vw..are there other alternatives? Wow……VW needs to look at the demographic changes happening in the US and Canada. Almost 25% of the population is over 60 years of age and the baby boomers that grew up with the Camper Van have no alternative in the market for a compact well built camper vehicle. In fact Mercedes has done an excellent job of securing this market with van conversions that are well over $60,000.00. Wake up VW! VW is obviously out of touch with this market segment. Bring the California to NorthAmerica with a TDi and the sales will take care of themselves. We owned a 1972 VW Westfalia, a superb vehicle for around town and extensive trips! I couldn’t agree more, Dennis. VW is clueless in the North American market. A TDI Camper would be an instant success, even at the $50-$60,000 level. PopTop Haven in Yucipa, CA 60-70 miles east of LA) has a great inventory, much of it not adverstised online. My husband and I saw the California van on the internet and fell in love with the family friendly utility. Living in Southern California we want a recreational van that can also serve as an everyday car and give us the flexibility to take a weekend trip on a moments notice. I must say we were very sad to find out the van isn’t available in CA or the US. I also think VW made big mistake replacing the van with the Toureg. The market is saturated with mid size SUVs. I’m sure VW would have had better success if they had kept the van. Hopefully they change their mind because my husband is looking for a used 2002/3 that has been restored. I would much rather have a new one, pay a bit more and keep it for a long time.